A prerequisite for the occurrence of vertebral fractures is exposure to very high forces, unless the vertebrae have been previously damaged by a reduction in bone density (osteoporosis/loss of bone mass) or other diseases (e.g. tumours or metastases in the vertebrae). 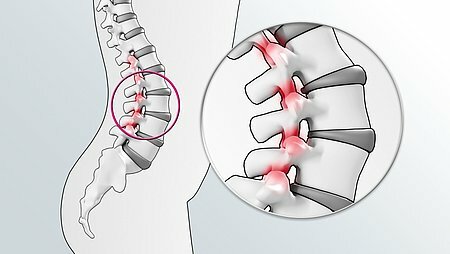 There are various forms of vertebral fractures: fractures of the vertebral body, the vertebral arch or of the spinous processes. 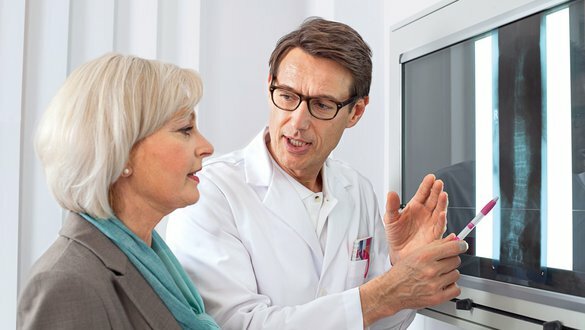 Vertebral fractures can occasionally be completely symptom-free. As a rule, the affected part of the spine will be painful on pressure, percussion and compression. Gibbus deformity (sharp angulation) or a palpable gap in the row spinous processes is only found rarely. The range of movement of the spine is often restricted by pain, the patient adopts postural guarding and the muscles go into spasm. If the spinal cord is involved, the patient develops corresponding neurological disorders or even deficits e.g. paralysis, paraesthesia or unnatural reflexes below the injury. Depending on the site of the vertebral fracture and the degree of spinal cord injury, complete paraplegia may result in severe cases.